A yacht of distinction for an unforgettable voyage in spectacular British Columbia, Canada. Cruise the BC coast aboard this classic luxury yacht in some of the world's best cruising grounds. Discover the warm and sunny marine playground of Desolation Sound. For the ultimate wildlife adventure, see humpback and orca whales, bears, sea lions, seals and porpoises on an eco-tour cruising through the Great Bear Rainforest. Built as a coastal freighter for the US Army during World War II, this classic wooden boat has led an exciting life with stints ranging from spy ship to research vessel to houseboat. 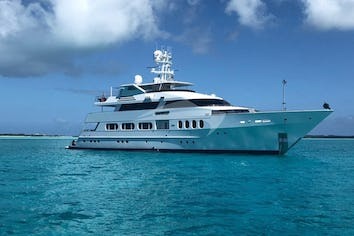 She was painstakingly refit in 2003 and now boasts all the amenities of a luxury expedition yacht while retaining her unique character. Discover the cozy warmth of gleaming teak, mahogany, and oak in traditional design. Indigenous Pacific Northwest Douglas Fir forms the table in the main salon where guests can recount their daily adventures with friends and family over a glass of wine. Pacific Yellowfin blends seamlessly with its natural environs as she incorporates all elements of West Coast culture in her presentation and services. One of Vancouver's leading interior design firms, Robert Ledinghan, created a superb decor. Combining gourmet cuisine and selected fine wines, the Pacific Yellowfin offers the finest in hospitality. A full array of tenders, water toys, kayaks, motorized scooters and mountain bikes allow a full experience of the area, both afloat and ashore. 5 crew, fuel, meals, non-alcoholic beverages, Pacific Yellowfin beer, one bottle of house BC wine per guest per day, and ﻿use of ship's equipment and water toys. 5% GST tax, fishing licenses, docking fees, other alcoholic beverages and satellite phone usage. Customary crew gratuity at the Charterer's discretion (15% advised). 6 night minimum for July and August. For the Great Bear Rainforest, please inquire. 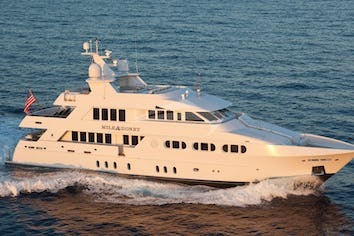 Final balance due 3 months before charter. Sleeps 2-3. QUEEN bed. Couch that becomes SINGLE bed (not shown in layout diagram or photos). Five opening, screened portholes. Door to the outside deck. Private ensuite with shower. Sleeps 2. QUEEN bed. View windows. Private ensuite with bathtub/shower. Sleeps 2-4. QUEEN bed on one side. 2 SINGLE offset upper/lower beds on the other side. Private ensuite with shower. Sleeps 2-3. DOUBLE bed on one side. Drop down Pullman SINGLE bed on the other side. Two opening portholes. Private bathroom across the hall, with shower. Main Salon dining seats 8. Aft Deck dining seats 10. - 2 settes on the common Aft Deck (which can be fully enclosed). 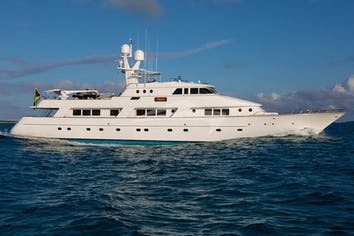 As the Captain and co-owner of the Pacific Yellowfin with his wife, Colin delivers unique luxurious private yacht cruises along the BC coast. As a long-time sufferer of “wooden boat disease”, his love of the water started in childhood in Dublin’s busy DunLaoighre Harbour. From his early experience on fishing trawlers in the North and Irish seas to his first boat, a 72-foot seiner, his passion for boats has spanned more than five decades. Colin has cruised the BC coast for more than twenty years and his love of the sea and interest in people make him incredibly knowledgeable of all fishing hot spots, beautiful hikes and secret waterfalls. Numerous guests have commented on Colin’s sense of humor and storytelling abilities, with “kids” of all ages enjoying his tales. His mastery over Pacific Yellowfin makes our guests feel utterly safe. When he’s not working in his Vancouver-based painting and decorating company, Colin can often be found tinkering aboard the Pacific Yellowfin, having a Guinness or our own Pacific Yellowfin Ale. Meet Nik, our Chief Deckhand and Wilderness Guide, extraordinaire. Born in rural New Jersey, Nik grew up on the banks of the beautiful Niagara River where his love of nature began. Completing his degree in Environmental Studies at York University in Toronto, he then continued his tourism and outdoor recreation program in Sooke, BC. Nik has worked in the coastal waters of BC for the last 4 years as a wilderness guide, kayak guide and deckhand. Along with a great sense of humour and an all-day smile, he comes fully certified to take care of you, safely and enjoyably through interpretation by land and sea. An absolute treat to be around, and will keep you smiling throughout your whole journey. Meet Ben, our charismatic Red Seal Chef, Sommelier and local Island boy. Growing up on Salt Spring Island on the coast of BC, Ben has always been surrounded by the ocean, farms and amazing wildlife. These three things have influenced all aspects of his life, from becoming a Chef to traveling the world. Having spent over 10 years in the restaurant and catering businesses, Ben has found his niche at Pacific Yellowfin to indulge his local, farm-to-table passions. Your Chef delivers astonishing quality with fresh, locally grown, organic products from local mainland and island markets. With ample sunshine, we grow our own fresh herbs on board! The trip ranked up near or at the top of the trips we have taken with our family. The crew was incredible displaying a genuine interest in making sure every detail was address and that everyone had a ball. Colin has assembled a very eclectic group of amenities on Pacific Yellowfin which I don’t think could be easily replicated elsewhere. I believe that the itinerary covered some of the most beautiful places on earth. Our family was exposed to activities that we had not previously experienced. From motor biking on the islands to the 40 foot waterslide to gathering our own oysters the verdict by my family and friends was unanimous! Guilty of having too much fun! Thanks so much for referring us to Colin! We highly recommend this trip to anyone! The trip was a total success. Things could not have been much better with the Yellowfin. Her accommodations and her crew were just as I had hoped if not a bit better. The food was very good and the chef was flexible enough to satisfy everyone. Colin and the crew ensured that we never wanted for any activity. Their intimate knowledge of the area is priceless as is their unending patience with the kids. We have chartered several times in the past and can say without doubt that Colin and his crew are the best ever. A tremendous experience. Beautiful scenery, excellent accommodations, superior captain and crew, and delicious food. This trip was a wonderful adventure for us. Thanks, thanks, thanks. I am so happy I had the chance to discover this beautiful area. I think words are not enough to describe the breathtaking scenery. The trip was fabulous and so perfect. Life on board is peaceful. The Pacific Yellowfin is an interesting yacht, extremely comfortable and stable. She is maintained in an amazing condition by her wonderful crew! Captain Colin is a very nice and attentive man, and lover of his beautiful area. Hello Colin and the rest of the FABULOUS crew! We hope your next charters have been fun. Our week with all of you was definitely the best trip of ALL of our lives! You, the crew, were so wonderful and ready to try all of our ideas! We loved you all! You were accommodating, fun, and always happy! Thank you all for that! And the boat was the perfect one for our family; comfortable and with all the right 'toys". And the food: well, what can I say!? It was ALL delicious/perfect size portions and beautifully presented! We miss the meals! So you will definitely see us again!! Have a wonderful end of your summer and we will be in touch! Thank you again from all of us for a truly memorable vacation! Main Salon. Country Kitchen in the far end. Master Stateroom with Queen Bed on Main Deck. Stateroom 4: Double Bed + Pullman Single Bed on left. Aft Deck Dining and Seating. Can be fully enclosed. VIP Stateroom with Queen Bed on Upper Deck. Tubing in the warm waters of Desolation Sound.